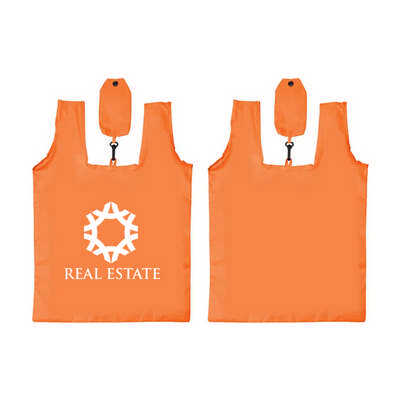 Compact Foldable shopping tote bag is reusable and recyclable, plus they can be personalized with company name or logo. They make excellent bags for shopping or days at the beach, and can hold a great deals of Its. Definitely a great environmentally friendly alternative to your normal everyday shopping bag! Material - 210D Polyester Colours - Red, Yellow, Blue, Purple, Black, Green, Orange, Magenta, White, Over 20+ colours, please contact us for more options Product size - Standard Unfolded: 360 x 580mm, include handle 160mm(H) Folded: 155 x 80mm/ Without Gusset Print size - Unfolded: 250mm(W) x 300mm(H) Folded: 50mm(W) x 55mm(H). Price includes : 3wk 1 col/pos print. Setup is included.